The Libyan revolution is the re-opening of a national, democratic, anti-imperialist revolution, notwithstanding NATO military intervention. This is proved by the defeat of the 42-year-long pro-imperialist Gaddafi semi-fascist dictatorship at the hands of the popular militias. While NATO softened up Gaddafi's forces and co-opted the TNC to impose a 'democratic transition', it has yet to show it can contain the popular armed militias and hold on to Libya as an imperialist oil colony. NATO will brag about its success in Libya in defeating Gaddafi but we give the ranks of the revolutionaries the major credit for this victory, and unlike most of the Western liberal ‘left’ recognise their historic revolutionary agency. The revolutionary communists never equated the base of the rebellion with the pro-imperialist TNC nor said that the intervention of NATO would be the deciding factor in this war. We always saw the rebellion as the reopening of the national revolution that to succeed would have to become permanent revolution. But against this revolutionary perspective much of the Western 'left' operates with a schematic view of the national question which separates it from the class question. This schema has its material base in the social imperialism of the labour aristocracy. The reformists have illusions in 'democratic' imperialism while the 'third worldists' have illusions in progressive national leaders. Both are the 'left' version of the imperialist (Eurocentric, Orientalist) 'civilising mission'. Western liberal reformists are tied by their class interests to 'democratic' imperialism. The idea that imperialism could, especially in its UN guise, be 'humanitarian' and intervene to prevent a massacre in Benghazi is to argue that in some situations imperialism can be 'progressive' in offering a helping hand to sponsor 'democracy'. But since imperialism came on the scene in the 19th century it has been the enemy of bourgeois democracy. It has fought thousands of wars to stop the bourgeois national-democratic revolutions from coming to fruition. It is doing so today notably in Iraq, Afghanistan and Pakistan. The intervention of NATO at the invitation of the TNC was no different. It took sides with one faction of the Libyan national bourgeoisie against Gaddafi, for the purpose of containing and limiting the national-democratic revolution and to impose a new neo-colonial regime. The fact that it doesn’t in Bahrain, Saudia Arabia or Syria simply means that imperialism is not yet ready for regime change in those countries. More dangerous than the openly pro-imperialist liberal reformists is the deceptive reverse side of social imperialism - 'third worldism' - the view that a section of the national bourgeoisie can lead a popular front or an anti-imperialist united front to a victorious revolution. This explains why the most fake Trotskyists lined up with black nationalists and the '21st century socialists', Castro and Chavez, to back Gaddafi against imperialism and the insurrection. It also explains why the left reformist SWP thinks that NATO in backing the TNC faction of the national bourgeoisie has usurped the revolutionary agency of the 'rebels' and that the counter-revolution has won. For these Mensheviks if there is no progressive bourgeois faction in place, then there is no leadership of the national revolution. Social imperialism in both guises denies revolutionary agency to the semi-colonial masses and misplaces it in the petty bourgeois intelligentsia of the imperialist countries. History will consign these social imperialists to the dustbin. The Libyan revolutionaries who had taken a strong anti-imperialist position in the early days of the rebellion had little choice but to enter into a military bloc with NATO against the semi-fascist Gaddafi. At this point the semi-fascist Gaddafi regime has been defeated by the insurrection. It remains to be seen the extent to which the revolutionaries have illusions in 'democratic' imperialism or how far their opposition to imperialism takes on the form of Islamic radicalism. To defeat the TNC and its imperialist backers the revolutionary forces must continue the armed struggle at this point directly against imperialism, and all the pro-imperialist factions of the national bourgeoisie squabbling for the imperialist franchise, to finally win national independence and set the example for the other Arab states in their ongoing national, anti-imperialist revolutions. The only road to liberation is forward from the Arab national revolution to permanent revolution and the Socialist United States of North Africa and the Middle East! The Libyan revolution is the reopening of a national democratic revolution during a global capitalist crisis in which there are no national solutions to the national question. It is a national revolution against Gaddafi who has run for 42 years a national bourgeois crony capitalist regime negotiating terms for sale of oil with imperialism and pocketing the profits for his family, tribe and cronies. Gaddafi froze the national revolution by acting as imperialism's bourgeois agent in Libya. He masked the brutal nature of his regime behind the fiction of 'socialism'. His response to the protests in Benghazi in February exploded the myth that the regime was popular, progressive or anti-imperialist. A Bonapartist caught between the Arab Revolution and imperialism, he opted for imperialism in the hope that he could negotiate a new deal around the 'war on terror' against al Qaeda. It was his decision to annihilate the opposition that caused the armed insurrection that within 6 months was able to defeat Gaddafi's forces on the ground. Those who wanted to subordinate this armed rebellion against Gaddafi to a military bloc with him against NATO ignored the reality that NATO was taken by surprise by the Arab Spring and forced to act to suppress an armed revolution from spreading to the whole of North Africa and Middle East. By helping to take out Gaddafi as their ‘rogue dictator' they hoped to wipe their hands of him, regain control of the revolution, and impose a more suitable pro-imperialist regime with 'democratic' credentials. However, this plan by imperialism to divert the reopened national revolution to a 'democratic' transition is far from certain. It will have to subordinate the armed democrat insurgents to keep Libya as an oil colony of the EU and in doing so prove that the way forward is a complete break with imperialism and its bourgeois agents in Libya. It’s obvious that the outcome in Libya is far from settled. The TNC (or its successor) is balanced between imperialism(s) and the hostility of the popular uprising to imperialism(s) on the ground. It will have to negotiate between the different imperialisms, notably the US which needs more bases in its contest with China for Africa, China's multi-billion investments in Libyan oil, and the desperation of declining France, Italy and Britain to sign and enforce preferential agreements, on the one hand, and an armed populace that is now carrying the hopes of advancing the Arab revolution, which has the power to demand a radical redistribution of the oil profits, on the other. In other words the TNC (or its bourgeois successor) will be a Bonapartist regime trying to do the impossible in a global capitalist crisis with rising inter-imperialist rivalry over oil etc namely, reconciling the two sides of the basic contradiction, revolution and counter-revolution, that is now becoming activated regionally, continentally and globally. The global crisis facing imperialism is in direct contradiction to bourgeois democracy. The crisis of falling profits means that the price of oil becomes critical in capitalism’s return to profitability. The imperialist demand for oil at a time of global crisis will allow no room for substantial democratic reforms, especially with the damage to oil production during the war. This is an important point, because the social imperialists think that even in the midst of the crisis the TNC can free up frozen Libyan funds so that goods can be paid for to meet the immediate needs of the Libyan masses and 'buy' legitimacy for the new regime overseeing the 'democratic transition'. The TNC blames imperialism for not releasing these funds and risking the failure of the 'democratic transition'. They have illusions in imperialism to deliver democracy in Libya and do not see that imperialism cannot deliver democracy when it is driven to restore the rate of profit. In the wider global economy this fits with the liberal bourgeois view that 'austerity' is a policy option not a precondition for capitalist survival. Thus the TNC regime installed in place of Gaddafi has no room for manoeuvre. The NATO powers, particularly France and Italy, are scrambling among themselves for new oil contracts that freeze out a surgent China. They have already signed deals with the TNC which has in turn said it will honour all of Gaddafi’s contracts. Italy and France are declining imperialism’s and will quickly resort to military invasion to enforce their contracts. Britain is a major financial centre that is now faced with the beginnings of popular opposition to its austerity measures and will also deploy its troops to protect its interests in Africa and support the US in its rivalry with China. They will also demand that the TNC regime stops the flood of refugees to the EU. China in Africa is pursuing an imperialist policy and is now the most influential great power in that continent. 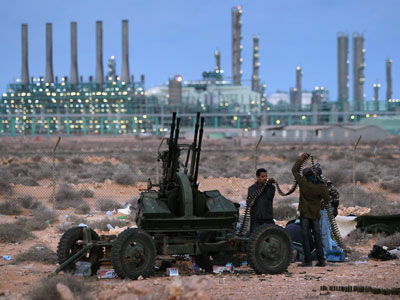 It has billions invested in Libya to develop oil production and infrastructure and has belatedly along with Russia recognised the TNC in an attempt to protect its assets. If the TNC turns its back on China we can expect it to look for support in other sections of the Libyan bourgeoisie. It won't back Gaddafi's crony capitalism directly as he is a spent force with the African Union coming out against him. But some of Gaddafi's faction could easily re-emerge to promote preferential deals with China in the same way that it has done deals with other fake left bourgeois factions in Africa like ZANU-PF to swap scarce and valuable minerals for rapid infrastructure development. China then, is in a good position to strike a deal to swap oil in exchange for rebuilding the now war ravaged infrastructure of Libya. Thus the global capital crisis means that weak declining imperialist powers such as France and Italy will put strict terms on the TNC regime which will not allow economic independence of Libya and impose austerity and state repression on the people at the same time that China will offer much more preferential investment to develop the economy. This is likely to create rivalry between factions of the Libyan bourgeoisie jockeying to serve competing imperialisms. No doubt France and Italy have their champions in the TNC, but who will champion China and Russia and win the admiration of Castro and Chavez? The other side of the contradiction is the Arab Revolution, not limited to the popular militia in Libya. The armed people’s militia has shown that it is has only recently come under a unified command, with Misrata and the Western mountain insurgents remaining largely outside the Benghazi command. Much has been made in the capitalist media of the dependence of the popular militia on NATO, and the gutter press has engaged in jingoistic tales of ‘special ops’ leading the fight. This is rubbish. Imperialism intervened in Libya to prevent the insurrection from turning into a rebellion. For this reason is did not arm the rebellion to allow it military superiority. Its objective was to take away Gaddafi's military advantage and force him and the TNC to negotiate a solution. Gaddafi did not oblige, and nor did the revolutionary fighters submit. While NATO helped to bring about the defeat of Gaddafi as necessary to contain the revolution, it and the TNC its new agent, has not gained control of the revolutionaries. In particular the Misrata fighters and those of the Western Mountains made up of both Arabs and Berber are refusing to take orders from TNC appointees. The ongoing battle to destroy the Gaddafi forces will favour these independent forces and limit the ability of NATO and the TNC to determine the outcome in imperialism's favour. For the first time in the Arab revolution we now have an armed people’s militia that has removed a dictator and created the conditions for the national revolution to become permanent! We must honour the revolutionary spirit of the revolutionary fighters especially its youth ranks who have born the brunt of battle and paid the price in human life of the campaign to defeat Gaddafi. One battle has been won, but two battles remain. These battles are conjoined. The first is to stop imperialism imposing a new neo-colonial regime through the TNC. The second is to fight to create a workers and peasants republic that will complete the anti-imperialist revolution as a socialist revolution. We need to continue to call on the people's militia that actually exists on the ground to refuse to disarm, to form their own organs of self-government, to form a national workers and soldiers assembly with the tasks of controlling and planning the national economy, and to carry the revolution forward to a complete break with imperialism and all of its local bourgeois agents of all colors and creeds. So we offer a program for the revolutionaries and support those among them who are prepared to fight to retain their arms and form a popular militia to defend their February victory and open the road to their October. Can imperialism facing deepening crisis concede reforms sufficient to meet the expectations of the revolution? We say no. The global crisis of capitalism in its extremity cannot fulfil the demands of the democratic revolution, it will be forced to resort to ‘boots on the ground’ to disarm the democratic revolution. Will the revolutionaries agree to subordinate themselves to a new regime that does not renegotiate all the oil contracts and meet the demands for a democratic constitution? No! The first test will be to reject the constitution drafted by the unelected TNC in collusion with imperialism! If this imposed we say it will be necessary to counter-pose a revolutionary Constituent Assembly which allows for every citizen, male and female, above the age of 16 years to participate. How will the victory of the Libyan revolution affect the Arab revolution in Egypt, Tunisia, Palestine, Syria? We say that it will strengthen those who are prepared for armed resistance against those who hope that pacifism will lead to a UN intervention. Whither the Zionist regime? Already the Zionist regime is in crisis as its borders on all sides are less secure. It is lashing out in the West Bank and Gaza because it knows no other way to survive but fears outright attacks will push the Arab revolution further. The large middle class demonstrations against price rises have tiny minorities in them that are pro-Palestine, so it remains the Arab revolution, not left Zionism that will bring down Israel. Will the Arab revolution fuel uprisings in Sub Saharan Africa? The anger of the impoverished youth masses is ready to explode. Mass demonstrations in Swaziland and Malawi have been put down by brutal police force. In Zimbabwe socialists are on trial for watching videos of the Arab Spring and the regime is holding down food prices in fear of an uprising. In South Africa the popular front ANC regime is under attack from its opportunist Youth League under the pressure of the millions of black youth raging against the imperialist recolonising of Africa behind the 'humanitarian' UN resolution 1973. Will there arise in time a revolutionary Marxist organisation in all of these countries that is capable of leading permanent revolution? The onset of the many mass movements rising up to oppose the austerity measures of capitalism in crisis are met everywhere by autocratic regimes or popular fronts that prepare the masses for defeats. To open the road to revolution we revolutionaries must devote our utmost energy and commitment to urgently rebuilding a revolutionary international. Revolutionary party and program are essential conditions for permanent revolution. A revolutionary program only exists because of the fusion of theory and practice in a party organisation. Such a party based on democratic centralism can test the program in struggle and keep it alive. Our program comes from the experience of the Bolsheviks and was continued by Trotsky and the 4th International up to his assassination in 1940. That program contains the lessons of revolutions, both successes and failures. We say that in the epoch of imperialism oppressor countries continue to oppress other countries such as Libya. Therefore so long as imperialism prevents the fulfilment of the national tasks of economic independence, land reform, bourgeois democracy etc then the national question is still on the agenda. The national democratic revolution to realise its objectives must pass over to a socialist revolution. We call this process permanent revolution. It is the class question as national liberation can only mean proletarian liberation. Only the working class leading the poor peasants and all oppressed people can break with imperialism and its national bourgeois agents. What passes for Bolshevism today is insufficient to keep that program alive because it is not part of the working class and does not recognise its historic agency as we have seen in the case of the Arab revolution. Most of the remnants of self-proclaimed Leninism or Trotskyism have retreated from the proletarian dictatorship and opt for postmodern brands of bourgeois and petty bourgeois socialism. It is no wonder this new batch of Mensheviks is heavily infused with social imperialism in attributing to imperialism (NATO/UN) or its agents (Gaddafi) an historic progressive role rather than the popular masses leading the national revolution. Therefore the urgent task in this current global capitalist crisis is to rebuild a new international Bolshevik party based on democratic centralism and the program of the Fourth International of 1938 that is able to intervene decisively in all struggles and test its program as capable of being the guide to socialist revolution today. Refuse to disarm; disband the Gaddafi army, form a popular national militia! For the formation of local, regional and national councils of action to implement the immediate needs of the masses for food, health and housing; for equal participation of women and youth; for a Workers and Soldiers Assembly! For a Workers' and Farmers' Government! UN and NATO out of the country; all imperialist trade ties revoked and all contracts cancelled; return Libya's assets; seize non-compliant imperialist assets; socialisation of all privatised assets! Down with the TNC/Imperialist draft Constitution! This Constitution is imposed by imperialism not the revolutionary masses! Boycott the ratification of this Constitution! For a Revolutionary Constituent Assembly! The crimes of Gaddafi and his cronies, and the alleged crimes of the revolutionary forces, to be judged by Libyan peoples' courts, not the imperialist International Criminal Court! For opening of the borders between all the Arab states from Tunisia to Syria! For the national, ethnic and cultural rights of historic peoples such as the Berber; for full democratic rights to all migrant and displaced peoples! For equal rights of women and youth! For socialisation of oil and banks as part of a national plan to develop the economy as part of the wider economy of the whole region. For a Socialist Federation of Workers Republics of North Africa and the Middle East! Note from the RKOB: While we fully support the resolution’s line and programme for the Libyan Revolution we want to point out that we do not share some formulations in the resolution (e.g. we consider the Gaddafi-regime not as semi-fascist but as bourgeois-bonapartist; we characterise the British SWP as centrist, not left-reformist). We also believe that the sentence – “The Libyan revolutionaries (…) had little choice but to enter into a military bloc with NATO against the semi-fascist Gaddafi.” – is misleading. In fact it was a weakness of the Rebels that they did not look for an alternative strategy and did not issue a strong appeal to the mass movements in the Arab countries and the international workers movement for volunteers and material and military aid.